RabbitMQ provides, among other features, clustering capabilities. Using clustering, a group of properly configured hosts will behave the same as a single broker instance. All the nodes of a RabbitMQ cluster share the definition of vhosts, users, and exchanges but not queues. By default they physically reside on the node where they have been created, however as from version 3.6.1, the queue node owneriship can be configured using Queue Master Location policies. Queues are globally defined and reachable, by establishing a connection to any node of the cluster. We will take you on a step by step journey from zero to the cluster. We are going to use different technologies, although we will not get into the details of all of them. For instance it is not required to have a deep CoreOS/Docker knowledge for the purpose of executing this test. core@core-01 ~ $ etcdctl set /my-message "I love Italy"
Go to http://<your_ip>:15672/#/ in this case: http://172.17.8.101:15672/#/. In order to scale up the node above, we should run another container with --link parameter and execute rabbitmqctl join_cluster rabbit@<docker_host_name>. In order to scale down we should stop the second container and execute rabbitmqctl forget_cluster_node rabbit@<docker_host_name>. Turn into more positive. e.g. This is one of the areas where further enhancements on automation would be helpful. We need docker orchestration to configure and manage the docker cluster. Among the available orchestration tools, we have chosen Docker swarm. 1. Swarm initialization: to the node-01 execute docker swarm init --advertise-addr 172.17.8.101. Swarm initialized: current node (2fyocfwfwy9o3akuf6a7mg19o) is now a manager. Docker swarm cluster is is composed by leader node and worker nodes. To create the cluster we use the rabbitmq-autocluster plugin since it supports different services discovery such as Consul, etcd2, DNS, AWS EC2 tags or AWS Autoscaling Groups. We decided to use etcd2, this is why we tested it on Configure CoreOS cluster machines see step 8. Ready to the final round, create the RabbitMQ cluster. Note: The first time you have to wait a few seconds. Congratulations!! You just scaled your cluster to 5 nodes! Same to the other nodes, you have more or less the same number of containers. -e RABBITMQ_ERLANG_COKIE='ilovebeam' Set the same erlang.cookie value to all the containers, needed by RabbitMQ to create a cluster. With different erlang.cookie it is not possible create a cluster. Enables a periodic check that removes any nodes that are not alive in the cluster and no longer listed in the service discovery list. -e CLEANUP_WARN_ONLY=false If set, the plugin will only warn about nodes that it would cleanup. AUTOCLUSTER_CLEANUP requires CLEANUP_WARN_ONLY=false to work. gsantomaggio/rabbitmq-autocluster The official docker image does not support the auto-cluster plugin, in my personal opinion they should. I created a docker image and registered it on docker-hub. AUTOCLUSTER_CLEANUP to true removes the node automatically, if AUTOCLUSTER_CLEANUP is false you need to remove the node manually. Note: Enabling the mirror queues across all the nodes could impact the performance, especially when the number of the nodes is undefined. Using "ha-mode":"exactly","ha-params":3 we enable the mirror only for 3 nodes. So scaling down should be done for one node at time, in this way RabbitMQ can move the mirroring to other nodes. 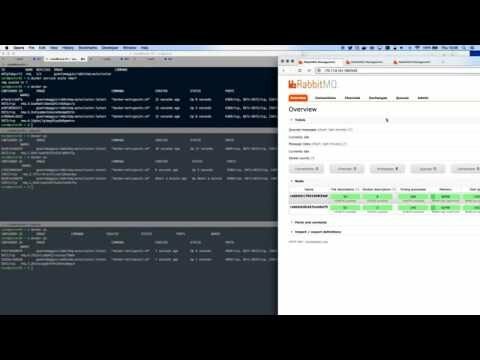 RabbitMQ can easily scale inside Docker, each RabbitMQ node has its own files and does not need to share anything through the file system. It fits perfectly with containers. Scaling RabbitMQ on Docker and CoreOS is very easy and powerful, we are testing and implementing the same environment using different orchestration tools and service discovery tools as kubernetes, consul etc, by the way we consider this architecture as experimental.